The vivid, fast-paced account of the siege of Khe Sanh told through the eyes of the men who lived it. For seventy-seven days in 1968, amid fears that America faced its own disastrous Dien Bien Phu, six thousand US Marines held off thirty thousand North Vietnamese Army regulars at the remote mountain stronghold called Khe Sanh. It was the biggest battle of the Vietnam War, with sharp ground engagements, devastating artillery duels, and massive US air strikes. After several weeks of heroic defense, the besieged Americans struck back in a series of bold assaults, and the North Vietnamese withdrew with heavy losses. 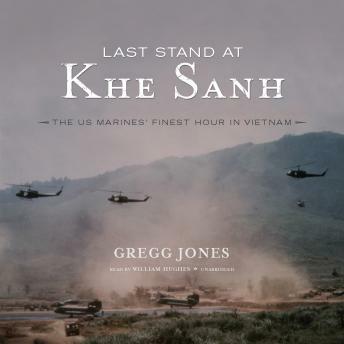 Last Stand at Khe Sanh is the vivid, fast-paced account of the dramatic confrontation as experienced by the men who were there: Marine riflemen and grenadiers, artillery and air observers, platoon leaders and company commanders, Navy corpsmen and helicopter pilots, and a plucky band of US Army Special Forces. Based on extensive archival research and more than one hundred interviews with participants, Last Stand at Khe Sanh captures the courage and camaraderie of the defenders and delivers the fullest account yet of this epic battle. This is a book every Marine should read ,esprit de corps ,raw courage, unbelievable action,riveting story just excellent .